I'd vacation there if, you know, the blood thirsty monsters didn't exist. Even a game this glorious has a few small flaws. Most noticeably, a flawed camera system plagues both online and offline play. The camera remains fixed behind your character most of the time, and it can be repositioned by hitting the left shoulder button. However, when you are trying to position yourself in combat, you often find your camera facing exactly away from the creatures attacking you. While locking onto enemies is a little dodgy anyway, this camera problem simply adds to the difficulty. When you lock onto a target, you should be able to attack it immediately and directly. However, you often are slightly out of alignment with your target, meaning that your attacks breeze right past the enemy, missing entirely. These are particularly frustrating, since once you miss, you are wide open to attacks while you recover and realign yourself to your target. The interface, which is generally very clean and functional, also leaves you open for attack at times. You have an array of hotkeys to which you can bind items, attacks, and techniques. These hotkeys use the basic controller buttons, and you use the right shoulder button to "shift" to a second level of hotkeys. Customizing these keys makes it incredibly easy to use your various abilities on the fly. However, an unusual frustration appears when your MAG is able to use its Photon Blast. Your second tier of hotkeys vanishes, to be replaced by the Proton Blast abilities. You have no control over this, and although you don't have to use the Photon Blast right away, you don't have access to your second-tier hotkeys again until you use it. This sends you back into the menu, which, while nicely laid out, is cumbersome to navigate mid-game, especially in combat. Additionally, you only have six hotkeys at your disposal: the Y button is always assigned to "chat." Arguably, this limitation may be meant to force players to think strategically about what skills they can afford not to hotkey. However, it is a waste of valuable hotkey real estate to bind the Y button at all times to chat. Force-class players are most likely to notice these limitations, since their reliance on techniques over melee combat means that they'll be going back into the menu often in order to use the techniques they haven't hotkeyed, or that have been blocked out by the Proton Blast becoming available. Again, this is only a minor frustration. Slightly more frustrating, you cannot save any progress made on partially completed quests, nor can you save your progress through the main story. Any quests you start, you either have to finish or start again next time you log on. The quests are generally pretty short, though, and you can complete them in a single session. On the plus side, this makes a lot of sense for multiplayer games -- saving quests would present problems if you can't get that whole party back together again for future game sessions (so I suppose there is a silver lining of sorts). Pan Arms must die! Everything must die! Considering that the broadband adaptor just came out in the States, Sega dropped the ball by not including official broadband support in Phantasy Star Online. Broadband does work, but it takes some effort to set up. Considering that anyone with a broadband adaptor had to remove his modem beforehand and probably wants to use his new toy as much as possible, it seems a major oversight not to include support, even if the gameplay itself wouldn't have been improved. Requiring users either to reinstall their 56k modem or jump through hoops in the hopes of making the broadband work is just cruel. Besides, broadband support might have eliminated whatever small lag the game possesses. The lag is almost unnoticeable, but sometimes, you will see characters jump around on screen; monsters off in the distance will collapse and die, killed by a party member who, thanks to lag, seems to be right next to you before jumping to the monster's location. This lag doesn't affect gameplay very much at all, but occasionally, you do notice it. There aren't a lot of drawbacks exclusive to online play, but a couple deserve mention. As effective as the symbol chat system and the preset dialogue is, it can't account for everything. 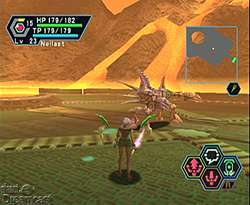 Typing messages to your team mid-combat is a nightmare using the controller, and you will definitely want a keyboard if you plan on actually interacting with the PSO gaming community. Also, secure player trading would also have been nice. Right now, if you want to trade items with another player, you simply drop that item and hope that your fellow capitalist does the same. The trading system is open for abuse by the unscrupulous, so be warned. One last frustrating downside: you can only save one character per memory card. This means that if, like me, you want to experiment with different character types, you are going to have a lot of memory cards lying around. On top of this, you can only play on your own Dreamcast, thanks to the registration and serial number. This is presumably part of a security measure to prevent duplicate characters from running around, although more likely, it's copy protection to cut down on piracy. As a single-player experience, Phantasy Star Online is fun, but it lacks life. Online play is the heart of the game, as the title suggests. Reviewing the single-player game, I'd probably give a score of seven or eight. However, playing online radically transforms the experience, and any of the small problems you might experience simply vanish as you become immersed in the gameplay. I'd be inclined to go with a ten if it weren't for those few little drawbacks mentioned above. The final score is based on a heavily-biased average of the two, but the bottom line is that you must have this game. 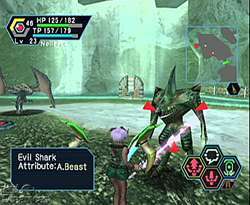 Even though it has a light story, even though it doesn't have much to offer solo players, Phantasy Star Online is a brilliant game--and what's more, it's a promise of amazing things to come in the Dreamcast's final days and in Sega's new future. Thanks to Laz, BenT, "*wheat*," and Mr. Domino for various roles in my online experiences for this review. Highs: Beautiful graphics and music, extremely fun, near lag-free gaming. Lows: Slightly clunky camera and control, weak VMU support, broadband a pain. Other: 1 player, Online Multiplayer, VMU Compatible (45 blocks), VGA Box, Keyboard, Jump Pack compatible, Modem, Broadband Adapter (if you're lucky...).